The US Department of Housing and Urban Development has released the Continuum of Care (CoC) FY 2018 Notice of Funding Announcement (NOFA). Acting as the Collaborative Applicant for the Three County Continuum of Care (MA-507), Hilltown CDC will coordinate the submission of the Three County Continuum of Care Consolidated Application to HUD due Thursday, September 18, 2018 by 8:00pm. The Consolidated Application can include three types of projects: renewals of current projects, new project requests to reallocate existing funds, or bonus projects for new funds. Applications are due to the Collaborative Applicant via the e-snaps web based system by Friday, August 17, 2018 by 5:00 pm eastern time to allow the Three County CoC Board to review, evaluate and rank in priority before the September 18 submission to HUD. Of note this year is $745,034 of funds available for reallocation – a unique opportunity for our area to fund projects serving priority homeless populations strategically. This entry was posted in 3 County CoC, Continuum of Care on July 17, 2018 by Pamela Schwartz. 1. Hurricane Maria Evacuees: We were finally able to gather some information on a majority, but not all, of the families who fled Hurricane Maria and were housed locally through FEMA/MEMA vouchers. As a result we added 73 persons to our PIT Count. Interestingly, HUD guidance specifies that, when assessing a CoCs performance in reducing or ending homelessness, they take into consideration the impact of natural disasters, and don’t penalize the CoC increases to PIT Counts that result. 2. PIT Trends Dashboard: The 5 year trend dashboard that I distributed at the Board Meeting has been updated and is attached here. 3. PIT Wiki Page: I’ve updated our Annual Point in Time Count page at the Wiki with 2018 information. This includes the 5 year trend report as well as our annual Community Point in Time Count interactive report. You may customize this report for one or more communities and download it as a PDF using the download icon. 4. HMIS Annual Report: We submit our HMIS Annual Performance Report to HUD at the end of April, and I summarize much of the reported data in a brief annual report – also featuring highlights that occurred throughout the year. The HMIS Annual Report is posted to the Wiki on the CoC Info page as well as attached here. This entry was posted in 3 County CoC, Continuum of Care, HMIS and Data Committee on May 7, 2018 by Pamela Schwartz. 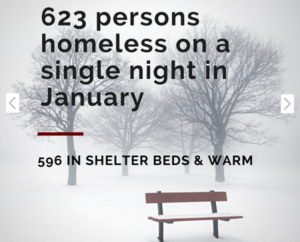 The 3 County CoC has prepared its 1st Annual Seasonal Shelter Report! The report includes information about the number of guests by location and region, the number of guests who could be categorized as priority populations, the demographics of guests, and the reasons why folks had to enter shelter. Let us know if have comments or suggestions about the report. This entry was posted in 3 County CoC, Continuum of Care, Data on August 2, 2016 by ACMiller. The 3 County CoC has created an interactive viz that examines 5-year trends in our Point in Time Counts. We were especially interested in finding out what drives year-by-year changes. Take a look! Interested? Local data is posted regularly to our Wiki. This entry was posted in 3 County CoC, Continuum of Care, Data on March 2, 2016 by ACMiller. The Three County CoC FY15 Application is available for public review here. This entry was posted in 3 County CoC on November 18, 2015 by Pamela Schwartz. The 3 County CoC has vetted and ranked the projects it will put forward for HUD funding as part of its CoC Program Application due on November 20th, 2015. Rankings for renewal projects were determined according to the CoCs Renewal Ranking and Evaluation Criteria. New projects were assessed according to several criteria including: capacity and potential sustainability; demonstrated experience including HMIS participation; dedication to meeting the needs of priority populations; and filling geographical needs. All projects were approved for funding by the CoC Board on October 28th, 2015. Soldier On reallocated its PSH funds to a Coordinated Intake project. Our CoC looks forward to partnering with Soldier On to implement an effective Coordinated Intake process! Additional details regarding final rankings and funding are available here. This entry was posted in 3 County CoC, Continuum of Care on November 6, 2015 by ACMiller.